Living in NYC has given me a unique perspective on the different types of architecture that surround me. When I return from traveling, I always notice the architectural similarities to the place(s) I may have just returned from. The influx of different cultures brings to the city, through their styles and designs, a mini "trip" abroad. At least, architecturally. While I am sure there are many more styles and variations, I am going to focus on Dutch and Parisian to start. Gable roof details, narrow width townhouses and large windows help to describe just a few of the features about traditional Dutch architecture circa 1700's or before. Pardon my somewhat blurry image (taken a while back on one of my trips to Amsterdam) but it illustrates the dominant (and may I say beautiful) style you see. 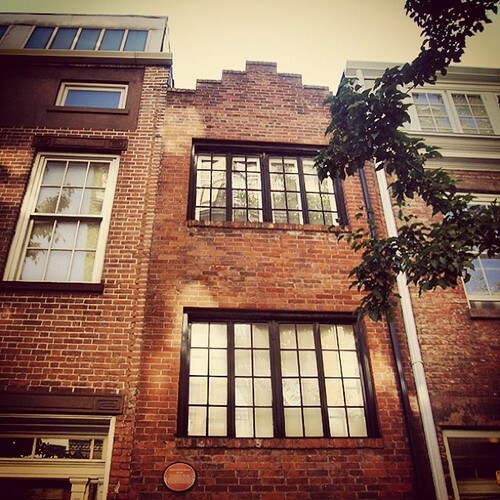 Fast-forward across the pond to NYC, where we have a special little treasure sitting in the West Village. Not only is the house in this traditional style (narrow, gable roof and large windows) but it also has the unique distinction of being the narrowest (8ft. 7in wide inside) house in NYC. Built in 1837, this house has been a home to many notables including Cary Grant! I ran into this house a number of years ago and recognized it's style immediately. I jumped off my bike and took a closer look being drawn in by the plaque on the front. I really loved discovering this home, which is currently on the market, and often make a point of riding by it when I need my Dutch fix. I was preparing for a trip to Paris a year or so ago, and boy do I miss it. I waited too long to start my love affair with Paris and to date she is the only city I'll ever cheat on NYC with. One of the many, many reasons I love Paris (besides the museums, food, culture, wine, bread, chocolate, shopping, etc.) is the architecture and overall riduculousness at how gorgeous each block is. I stopped taking photos after a while and just enjoyed how special it was and how at ever turn it was literally a feast for my eyes. Imagine my joy as I discovered on a Upper East Side walk to the train that there was plenty of Paris right here in NYC. It's not an exact match but its got "inspiration" from Parisian style that I noticed right away. I have since been running around NYC looking for other architectural treasures to discover! Do you have a favorite building that reminds you of another place?